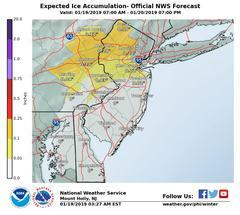 Latest forecast-the National Weather Service calls for possibly some snow, heavy rain followed by bitterly cold temperatures. As you know, there is a winter storm coming this evening that involves possibly some snow, rain, then followed by very cold/freezing weather. Your Department of Public Works is ready with 20 vehicles with plows and salt/sand spreaders. If there is snow, they will be plowing the roads and salting/sanding. Even if it does not snow, they will be salting/sanding as the rain tapers off so that roads don't freeze as temperatures drop. We ask that you help us! 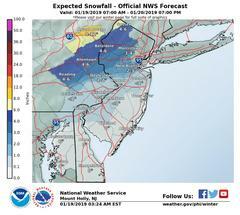 First, prepare before the storm arrives so you can stay off the roads unless you absolutely need to be out. Second, as with all snow events, please try to park your cars off the road so plowing and salting is easier for the crews. Finally, your understanding is appreciated for our drivers and crew as they do the work keeping us all safe. Thank you, stay warm and dry. 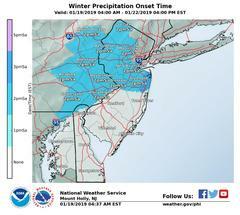 For areas near and north of the Interstate 78 corridor, precipitation will begin as snow this afternoon, but is expected to change to a wintry mix of freezing rain and sleet tonight. 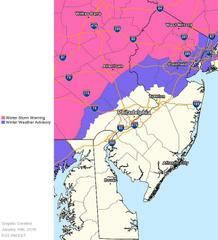 Very hazardous travel conditions are expected in these areas and freezing rain and wind could lead to power outages. Heavy rainfall in areas south of the rain/ice/snow transition zone could lead to both urban flooding Saturday night and Sunday and river flooding later Sunday into Monday. Flooding potential is largely dependent on how quickly the precipitation (starting as light snow today) changes to all rain this evening. Sunday morning, a rapid temperature drop will lead to a hard freeze of any areas of slush and standing water, even for areas that received little to no snowfall. This will lead to very icy conditions Sunday evening and overnight. Bitterly cold air will make clearing snow and ice very difficult. Minor coastal flooding is possible with the Sunday morning high tide, mostly along the Atlantic Coast, Delaware Bay, and the tidal Delaware River. Localized moderate flooding is possible along the oceanfront and on the back bays. Strong winds behind the storm late Sunday through Monday will lead to hazardous conditions over the waters for mariners and localized power outages on adjacent shores.